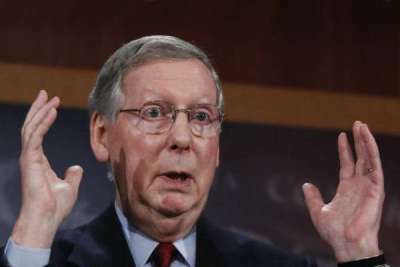 McConnell, who reminds people of a turtle, says it’s best not to hurry. NEW YORK — In a surprise political shift of responsibility, Senate Majority Leader Mitch McConnell has decided that he will now be manning the helm of the public transport agency of New York City, the MTA. With the recent extension on the self-imposed deadline to repeal and replace Obamacare, McConnell has stumbled upon a cache of free time. In keeping with the spirit of productivity that the Senate is so popularly known for the Majority Leader has decided that his skill set would provide and even greater service to the Metro Transit Authority. “If I could stall even just one bus route… one subway line… well, then I’ve done my job,” continued McConnell. In a revolutionary policy shift, McConnell has also decided that numbers and letters will no longer be assigned to the MTA’s vehicles of transportation. Employees of the MTA are not as confident with the sudden shift in authority. Residents of Manhattan as well as the surrounding areas have been cautioned to utilize other modes of transportation such as hang gliders, zip lines, and being shot from a cannon if they plan to arrive to their destinations on time.